Months of prior planning went into the project starting as far back as 2012. 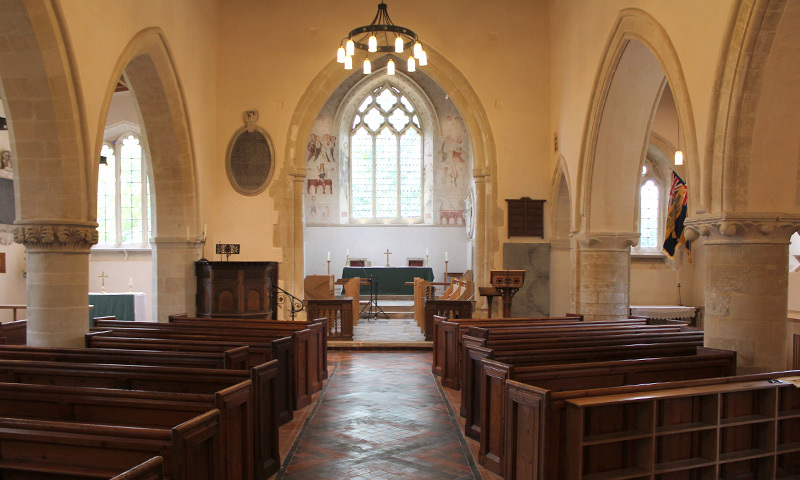 Visits were made to other churches to see heating and lighting schemes and to hear digital organs, presentations were made by potential suppliers and papers were prepared for discussion by the PCC. 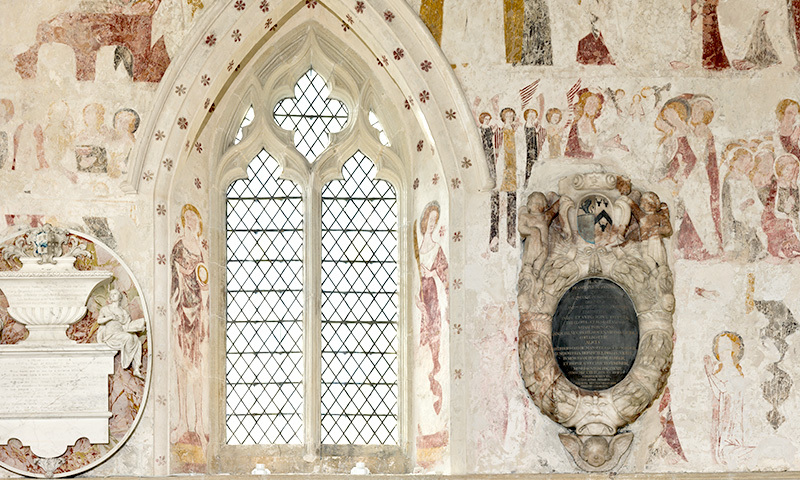 Once decisions had been made about the type of heating and lighting, detailed plans could be drawn up by the church’s appointed architects, and the wall paintings conservator, Madeleine Katkov, was consulted for information on what work was needed to conserve the chancel wall paintings. Draft plans were again presented for approval by the PCC. In 2013 an Appeal was launched to raise the funds needed for the project and a bid was prepared for a grant from the Heritage Lottery Fund (HLF). At the same time work was commenced on applying to other grant aiding bodies for grants to assist with paying for the work needed. A Stage one grant from HLF was received in 2014 allowing us to continue with preparation of the HLF Stage two grant application which was submitted in November 2014. The grant was approved in March 2015 meaning that we could proceed with the project. A short video was produced describing what was planned. 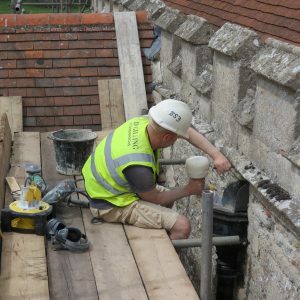 Work began on the project on 1st June 2015 when the building and site were handed over to the contractors Ward & Co, and finished ten months later on 1st April 2016 when they were handed back to the parish. Even though the old pipe organ had already been removed, as can be seen in this time lapse video, there was still a considerable amount of preparation to be done. 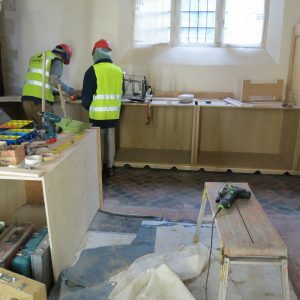 All the pews and other wooden furniture was removed, the benefactor, creed, ten commandments and Lord’s prayer boards were removed for renovation, as were the brasses in the chancel. All the monuments were boxed in to protect them from damage and the floor was covered with a hard wearing protective covering. Then the scaffolding could be erected while work continued on removing the old lighting, heating and wiring. To protect the wall paintings from dust a barrier was constructed across the chancel archway separating the chancel from the nave. Access to the chancel was then restricted to the priests door only. Outside the building, scaffolding and protective barriers were erected for work on the stonework and for the site Portacabin offices. 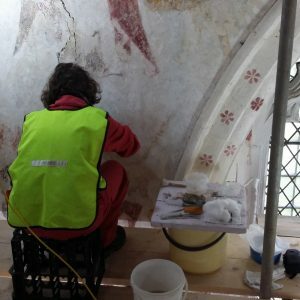 Whilst the chancel was being prepared for work, conservator Madeleine Katkov surveyed the plaster in the south porch, and the north and south aisles of the church to see if there were any other hidden paintings. The plaster in the south aisle was found to have been completed renewed, probably in Victorian times, but fragments of paintings were found in the porch and on the walls of the north aisle. Much of the existing plaster was unstable and had to be removed and while this was being done, the workmen discovered the fleur de lys painting over the north door. In the chancel the majority of the work consisted of cleaning and stabilising the paintings. In two or threeplaces there were serious cracks in the plaster, which was threatening to fall away from the wall, and this had to be stabilised and the cracks filled to prevent loss of any plaster and the paintings on it. During the cleaning interesting details of the paintings were revealed which had not been noticed previously. As part of the brief for the conservators, drawings were made of the existing paintings for future reference by historians and archaeologists. The newly discovered paintings in the south porch and north aisle were also cleaned and stabilised. Stonework around the outside of the church was in need of repair, as identified in the architect’s quinquennial report, and stonemasons set about replacing worn stones. The south side of the building seemed to need most work, but there were also sections of the other walls including the tower that needed work done. For the final work on the south porch external doorway, the master stonemason gave a demonstration to children from Chalgrove Primary School. The wooden louvres in the bell chamber of the tower were also replaced with new oak louvres and the priests door and the north door, with their ironwork, were cleaned and repainted. 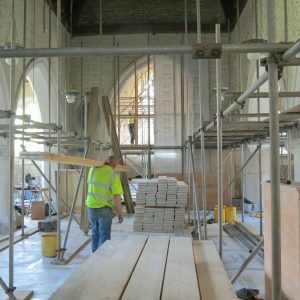 The refurbishment of the chancel, nave and aisles of the church was very thorough from the top down. The wooden ceiling of the chancel and the wooden framework of the nave roof, all in good quality pine, were cleaned and treated. 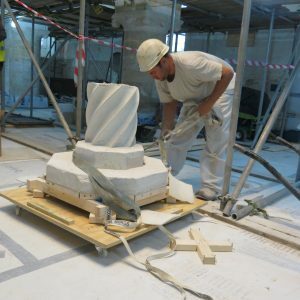 All the stonework, including the tracery of the windows, which had been painted with white emulsion paint at sometime in the past, was cleaned using a steam and vacuum process to take it back to its natural stone colour. Any repairs necessary to the stonework were made and it was finally re-pointed. The font was lifted off its spiral base and both bowl, base and octagonal plinth were placed in protective boxes. The stone plinth below the octagonal plinth was then remo ved completely. The electrical sockets and wiring for the new lighting scheme, the new heaters and the new sound system were installed throughout the building, and covered by metal conduits. All the unplastered walls, and those where unstable plaster had been removed, were prepared for re-plastering. A consignment of 31 tons of lime plaster was delivered to the site and re-plastering began. 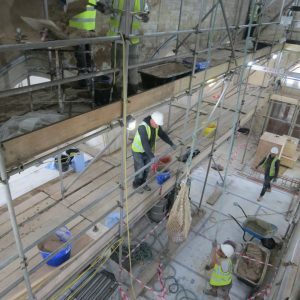 Mixed in a cement mixer outside, the lime plaster was wheel-barrowed into the building and then lifted by winch to the level of the scaffolding where it was required. The wooden parquet flooring in the chancel was removed and replaced by new paving squares in black and white, and damaged floor stones were replaced. Damaged floor tiles in the nave wer e replaced with matching tiles and places, where the spaces for the old metal heating grids had been filled in with concrete, were tiled with similar tiles. In the south porch the old wooden seats and panelling was removed and replaced by stone seating. The concrete floor was also replaced by a stone floor and the lintel between the porch and church completely removed to facilitate entrance by wheelchairs. New stalls and seats were designed and built for the choir in the chancel and the console of the new digital organ was also designed to match. 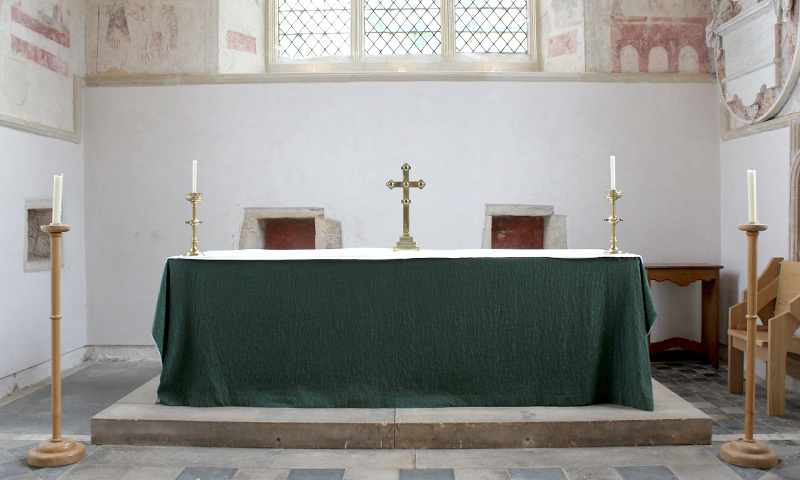 All the old Victorian pine nave pews were cleaned and refurbished where possible, while some of them, because of untreatable damage, were either red uced in length or cannibalised to make two small tables. The Jacobean pulpit, lectern and processional cross were all renovated by local craftsman Mick Lomas, who sadly died before the project was completed. New LED lighting was installed throughout the building, programmable and controlled by touch pads, with lighting tracks in the chancel allowing each of the 44 wall paintings to be illuminated in turn. The ‘tree of life’ gates to the south porch and the chandeliers installed in the nave, aisles and south porch were all made by local eminent master blacksmith, Michael Jacques, and his apprentices. He also made the door furniture for the new oak and glazed south door. The overhead radiant heating panels were installed in the nave, north aisle and south aisle. New oak cupboards were designed for storing specific items, such as the altar cloths, and were built around the south and west walls of the nave and also conceal the lighting, heating and sound system controls. From April to September, the church is open to visitors from 11am to 2pm on Wednesdays and from 2pm to 4pm on Sundays. More information on access to the church, parking and getting there is available here.